Note: This guide is expected to be followed to the best of a coordinator’s ability. A blatant variance from this guide will be reviewed by the Junior Recreation Committee. General Experience - Entering competition for the first time. Game Strategy - Just learning to play and primarily working on getting the ball into play. Movement & Footwork - Understands correct positioning when returning or serving. Lacks court recognition after point has started. Ball Control & Placement - Consistent hitting soft paced loopy balls. Does not have intended placement or direction. Strokes - Comfortable hitting forehands, backhands and serves. Net Play - Can make contact with the ball when at the net. 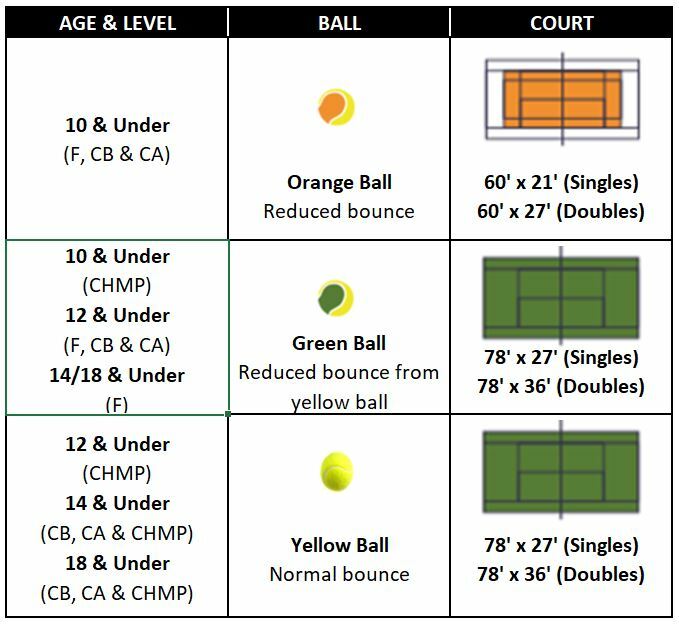 Serve - Able to serve some balls into the correct box from the baseline. Consistency - Inconsistent but can sometimes sustain a slow-paced rally with someone of the same ability. 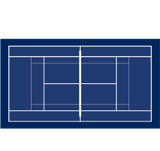 General Experience - Prior match experience including JTT & some challenger tournaments. Game Strategy - Lacks shot anticipation on returns and therefore can only react. Movement & Footwork - Lacks ability to anticipate and therefore has difficulty covering the court. Limited footwork. Ball Control & Placement - Consistent when hitting medium paced shots but lacks execution when trying for directional control, depth or power. Strokes - Not comfortable with all strokes including volleys, lobs, overheads and approach shots. Net Play - Can volley slower paced balls on both forehand and backhand side. Serve - (5 out of 10 times). Limited double-faults. Consistency - Fairly consistent hitting medium paced shots within reach. Difficulty ending points. General Experience - Extensive match experience and some success with challenger tournaments. Game Strategy - Has an idea of what game strategy to use but lacks ability to fully execute game plan. Movement & Footwork - Can cover the court well but may make errors because of timing and footwork. Ball Control & Placement - Improved stroke dependability with directional control on moderate shots. Strokes - Comfortable with all strokes. Player needs to improve control of height, depth, direction and speed. Net Play - Can volley medium paced balls and return with directional intent. Serve - Player is developing more spin and power on the first serve and seldom double-faults. Consistency - Consistent hitting medium paced shots but may error when opponent uses varying pace, depth and spins. General Experience - Playing championship level tournaments with some success. Game Strategy - Can attempt to vary game plan according to their opponents & can successfully execute strategy. Movement & Footwork - Can easily make adjustments to footwork and swing to execute a return. Ball Control & Placement - Dependable strokes including directional intent, depth, spin and pace. Strokes - Can control depth of shots, pace, and use various spins. Net Play - Aggressive net play. Serve - Can hit first serves with power and accuracy and place the second serve with accuracy. Consistency - Can consistently return a variety of spins and paces from various depths with control.